Tai Ji tells Mitali to gobble the Banana as the drama is going to begin soon. She added that they would get the prize money as the gift compensation for helping in catching the criminal. She and Mitali get happy in themselves of planning for future. Mitali tells that Police, Abhi, and Tanu will also get some prize money for them. Abhi and everyone come in the hall where the police inspector was standing already. He tells that he had taken his decision, and it’s the final decision. Pragya gets worried of seeing Tanu’s smile. Dadi tried to intervene, and he shuts everyone’s mouth up. Abhi explains that Sarla is a mother for her and he is her son. He takes back all the claims and apologizes to the inspector for the mistake. Inspector resists and insists him that he is going to arrest the culprit whatever the case will be. Abhi gives warning of commissioner, but he stands on his claims. Abhi gets angry as he tried to arrest Sarla. He tells the inspector that if he touches the lady, he will call the media and human rights commission. Police inform that Mitali had called them, Abhi warns them to keep their mouth shut otherwise get ready to be kicked out from the house. They had an argument and ultimately left the case. Tanu claims that Sarla is the real culprit. Abhi looks angrily on her and goes upstairs. Pragya gets happy. Dadi stops him and tells that he had taken the correct decision and as a son and grandson as well. Tai Ji stops Sarla and starts shouting at her. They start criticizing her and keeps on blaming her for creating a gap between Pragya and Abhi’s relationship. Dadi comes and scolds them for behaving so ignorant in the house and tells them to go to the hell. 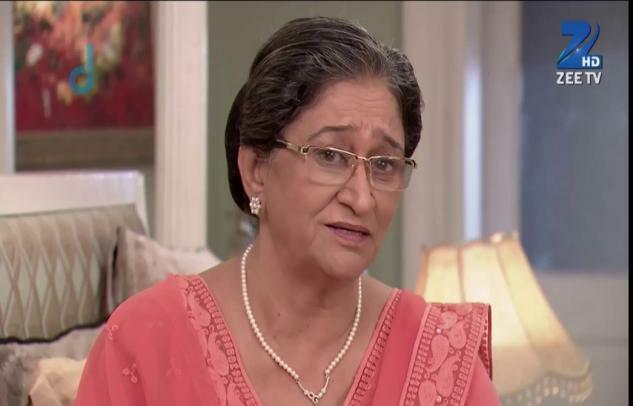 Sarla apologizes to her, but Dadi resists her to stay in the house. Sarla goes to pack her bags for return in her old house. She packs her bag while Dadi comes to make her believe that she is a help in this all scenario. They keep on arguing, and Pragya enters sadly in the room. They both hugged each other. Sarla tells him to concentrate on her path as she should not be a barrier for her in this fight against for her kumkum. Sarla went away from the room, and Purab comes to inform Abhi. Abhi went to stop her but get himself stopped as he couldn’t face her because of all these misunderstandings. Sarla comes in his room and bless him for the good in his life and walks away. Abhi falls in tears. pragya how to expose Tanu. writers did not do anything. Pragya and Abhi (Sriti Jha) please do something. otherwise they (Ekta kapor and her writer) wait for DNA test for tanus baby. story is so boring.